Create & Catch Up Days. Come and join us in 2019 for our “Create & Catch Up Days” . Begin making or complete any of my latest patterns that you might want to make or finish. To your left are just some of the patterns on offer. Learn American hand piecing, English Paper Piecing, Hand Quilting, Hand applique and Foundation paper piecing. We meet in the hall of the lovely little Mangrove Mountain Union Church, here on the Central Coast of NSW. Venue; Mangrove Mountain Union Church….2154 Wisemans Ferry Road Mangrove Mountain NSW 2250. PLEASE NOTE; You will need to BYO lunch please as there are no shop options. 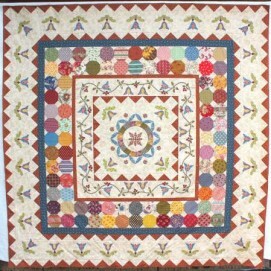 Chatsworth....A combination of EPP, machine piecing and hand applique. 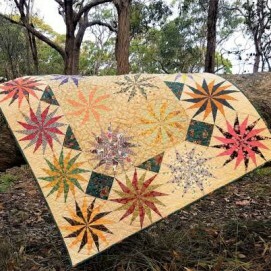 Twinkle....This beauty is foundation paper pieced.